We’re not sure why but popcorn seems to be really POPular at the moment and all sorts of posh popcorns are hitting the supermarkets. We got hooked ourselves (Tyrrell’s sweet and salty was the cheeky one that we kept buying) but this stuff is expensive (not as expensive as the rip off cinema popcorn though) and with Luca’s greedy pants dad in the house a big bag lasts about three minutes. So we’ve taken to making our own. It’s VERY easy and tastes even better, costs way less and you can choose what you put on it. Take 100 g popcorn kernels. Add one tablespoon of sunflower or vegetable oil to a large pan that has a lid. Heat it over a medium heat for a minute or two. Add the popcorn and, ahem, pop the lid on the pan. Continue heating it and give the pan a shake now and again. Soon after you hear the first kernel pop, it’ll go poptastic in the pan with popping at a crazy rate before it finally calms down. When the rate slows down a lot and it’s just occasionally, you’re pretty much finished. 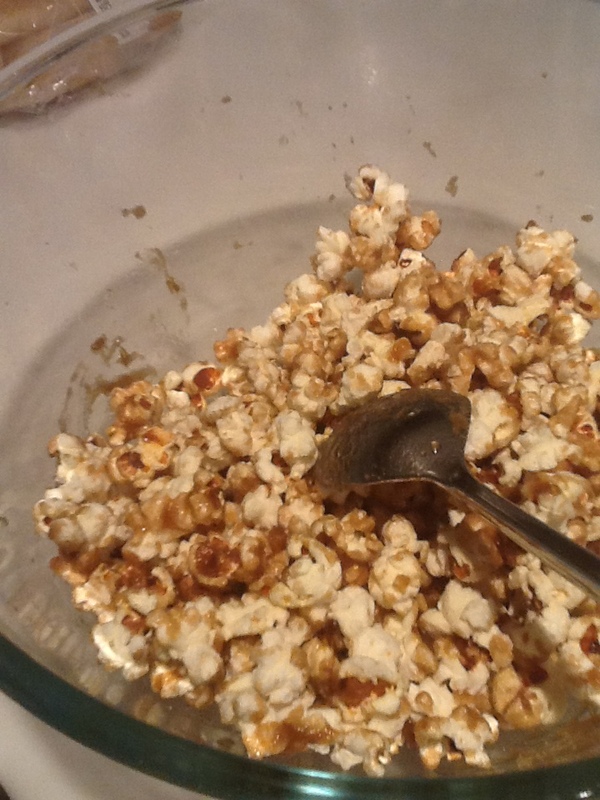 Turn the heat off and take the lid off (we find if you leave it on moisture gets onto the popcorn). So that’s the actual popcorn sorted. You could sprinkle it with a little salt, or a little sugar. Or both. Or grab a small saucepan, 60g of light brown sugar and 40g of butter. Melt it all over a low heat until it bubbles away for a few minutes. Pour over the popcorn (be very careful as it’ll be really hot). Wait for it to cool a bit for a couple of minutes but not too much. Absolutely delicious when slightly warm and it’ll put any bagged popcorn to shame.